"Keep it simple is the idea in this recipe. The beef is marinated in a mixture of lime juice and onion, seasoned with salt and pepper, and grilled. Serve with a Persian style pilaf." Cut beef into cubes 1x1/2 inch. Add to a medium mixing bowl along with the onion, salt, black pepper, and lime juice. Mix well, cover, and refrigerate overnight. Summer entertaining’s never been easier or tastier! Everyone gave this three stars. While it wasn't bad because we used a great cut of meat, there are tons of better ways to marinate that taste better. Not a repeat. I used a cheap cut of beef for this recipe and I think it was a mistake. Using a filet would have produced a much more tender result. It was delicious none-the-less. Yogurt is an excellent marinade. My husband was very doubtful, but it turned out wonderfully. We added some spices to this, cumin, I think. These were awesome. My husband and I love persian food and now we dont have to leave home to have it! This was a great recipe! 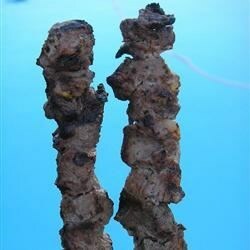 I made it using ground beef and shaped it around the skewer kind of sausage-like and then grilled it. I also tried it with ground chicken. So yummy!